The above card turned up this week in my mail-day package. Unfortunately though it is the wrong card. There is though only one person to blame. Me....I simply bought the wrong card. I clearly was just not concentrating when I hit the BIN at the time and did not pay attention to the auction description that accurately detailed the card in question. 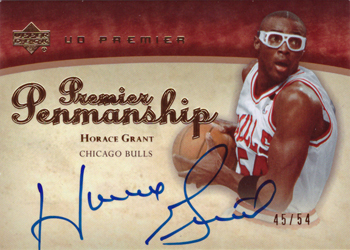 I was looking for the 2007-08 Upper Deck Premier Penmanship Autograph of Horace Grant, to go with the other five cards I have from the set. It transpires that there is a gold parallel version of the set as well! And it was the parallel version of Mr Grant that I unintentionally purchased. I really should pay a bit more attention before I hit that Buy It Now button!